After delaying the release for a couple of weeks, mega superstar Beyoncé FINALLY unveiled the Francis Lawrence-directed music video for her new single, "Run The World (Girls)" tonight on American Idol. The premiere just happened to coincide with Beyoncé's appearance as a mentor to the final three. While the video is VISUALLY stunning, the song is still a bit of a mess for me. Produced by Switch, Shea Taylor and Bey herself, the song heavily borrows from club hit, "Pon De Floor," done by Major Lazer and Vybz Kartel. The electro-dancehall infused beat doesn't mix well with Beyoncé's sultry smooth vocals, sounding more like a bad remix than a standout single. I really wanted to fall in love with the song after watching the video, unfortunately I'm still left wanting more. Here's hoping that the single's premiere on American Idol propels it higher on the Billboard Hot 100 chart because the way things stand right now, it's not looking so good for Bey's upcoming fourth album, 4. This week the track continues to sink on the charts, dropping 17 spots to #65. Just two weeks ago, the single peaked at a disappointing #33. Check out the gorgeous video below and see more of Beyoncé looking fierce and fabulous underneath the weird highway underpass thingy seen on the single artwork (ABOVE). Kind of reminds me of the bigger-budget version of Kelis' "4th Of July (Fireworks)" video, no? 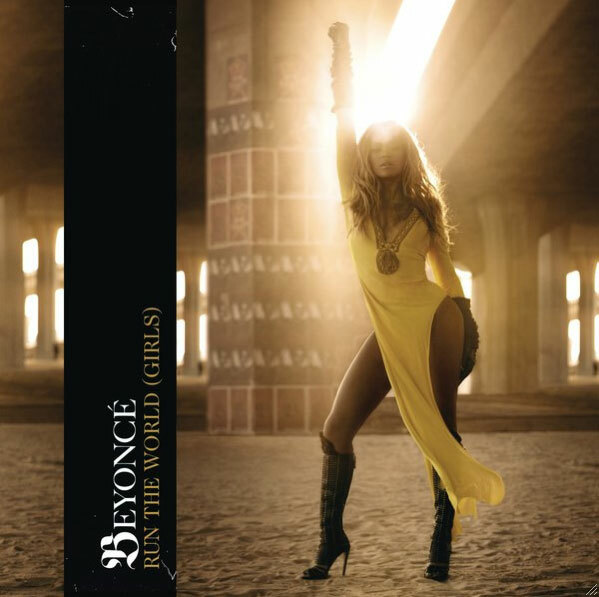 "Run The World (Girls)" is the first single lifted off of Beyoncé's fourth album, 4, due on June 28th via Columbia. Download the single on iTunes HERE. I know I'm a little bit behind with this news but I'm still going to talk about it because it's AMAZING! Nicola Roberts from Girls Aloud is releasing a solo album...AND it's ELECTROPOP! EEEEEEE! The album is called Cinderella's Eyes and is due out sometime this fall. The album's first single, the Diplo-produced "Beat Of My Drum" is due out in the UK on June 5th via Universal Records. Good for her. To come from a MAJOR girl group like Girls Aloud and dive into a solo career is huge. Add to that the mix that she co-wrote all of the songs? I'm impressed...and a little surprised to be honest. I've been a Girls Aloud fan for some time (I bought the singles collection! ), but to me, Nicola was one that faded into the background. Sure, she's absolutely stunning - porcelain skin, gorgeous red hair - but certain stronger personalities emerged from the group (*AHEM* - Cheryl Cole, Nadine Coyle). In the videos, Nicola always seemed to be a bit player. Sure, she had the occasional solo bit as a member of the group but she never got her fair share of the camera time. Looks like that's all about to change as Nicola gets ready to release "Beat Of My Drum." As a newly emerging solo artist, I can't help but think that Nicola is a little bit nervous, given Nadine's recent pop failures (her album barely cracked the Top 50 in the UK and her single peaked just outside of the Top 20) and given Cheryl Cole's relatively lacklustre performing sophomore album (which floundered after single #1). Cinderella's Eyes looks to be Nicola's long over due chance to emerge as an artist and I personally can't wait to see where she takes her career. Look for the album this fall and look for first single, "Beat Of My Drum" on June 5th. A second single will be released preceding the album's release this autumn. You can hear a snippet of "Beat Of My Drum" below (U.S. fans click HERE). Nicola Roberts overload! I'm so excited! Note: Pre-order the single on UK iTunes HERE OR a signed copy of the CD single HERE. You can also pre-order a signed copy of her album HERE. "Dearest All. Half of our new album (due out later this year BTW...) has been mastered. It's the final hurdle, and it sounds pretty darn good. Things, are going well today. Photo shoot is frantically coming together for next week too...I don't really like cameras. I think they feel the same. Either way, enjoy you're day! K"
OK. This is great news, however no word just yet on what this new album is going to sound like. I think it's safe to assume that the girls are going to be relying on their beautiful and engaging harmonies and retro-glam image. The question I have is what, if anything are they going to do differently this time? At one point, there were rumors floating around suggesting that The Puppini Sisters were going to release an album of original songs - more up-tempo, dancey songs. That was a long time ago and I can't find my source -needless to say, that album never materialized. Whatever the album sounds like, it will just be nice to have something new from The Puppini Sisters. While we wait for new Puppini Sisters material, make sure you check out Marcella and The Forget Me Nots, an "all-girl Post-Apocalyptic Cabaret orchestra" founded by Marcella Puppini. Check out a sample of this amazingness on a song called "What Have You Done To Your Face? ", which features on Twisted Cabaret Volume 1, available on iTunes HERE. Make sure you also check out The Puppini Sisters' back catalog on iTunes HERE and the fabulous video for "Boogie Woogie Bugle Boy (from Company B)" below.